L'Ile Rousse is a laid-back seaside town, lying at the foot of the Balagne hills. It has beaches of white sand, and a bustling marketplace with cafés huddled beneath the plane trees in the village square. Named after the islets that blush a deep russet red in the sunset, L'lle Rousse is a laid back seaside town with a central square, lively cafés, restaurants and ice-cream parlours. With one of the warmest microclimates in Corsica, thanks to the sheltering Balagne hills that surround the town, and three gently shelving large beaches in close proximity, L'Ile Rousse is an ideal spot for a family holiday. During the day, the town square fills up with pétanque players and pastis-sipping spectators, whilst the Greek style covered marketplace and little boutiques bustle with locals and tourists alike. Escape the hustle of town and relax on one of the three sandy beaches or follow the path up to l'Ile de la Pietra Genoese tower and lightlouse, for fabulous views across the town. Towering above the coast, the villages of la Balagne have changed little over the centuries and you will experience a way of life that is essentially Corsican. Village life is at a slower pace, and is ideal for those looking to get away from the hustle and bustle of 21st century life; but, thankfully, you're still only a short drive from the Balagne's beaches. Monticello is a delightful traditional village 5 kilometres from L’Ile Rousse with fantastic views of the coast. There are shops and restaurants in addition to picturesque walks and activities such as horse riding and tennis. Wander the streets of L'Ile Rousse old town and make sure you take a trip to the market held every morning in a majestic covered market place. The produce is local and fresh and includes fish, vegetables, local honey, charcuterie and cheeses. 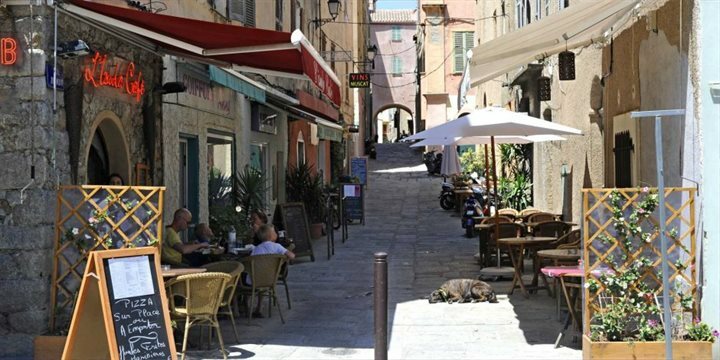 There are ample restaurants to choose from in the narrow streets and around the main square beneath the plane trees and the silver sand of Ile Rousse beach is very tempting. For the young or the old take a trip on 'Le Petit Train' a tourist train of L'Ile Rousse which will show you the sites at a leisurely pace. Calvi to L’Ile Rousse and beyond by train is a fantastic train journey will take you along the beautiful coast to L’Ile Rousse and then head to the hills - the perfect option for beach hopping or for exploring! The line is payable in sections with stops at the beaches and villages of the coast including a station at Arinella Plage & Lumio / Calenzana near the Camp Raffalli and a station in Marine de Davia and Sant Ambroggio. This coastline is home to some of the best beaches on the island (see Beaches section) and can be explored by the small train. Beyond L'Ile Rousse, at the foot of the charming Regino valley, is the beach of Lozari, a long curved bay with coarse sand, clean sea and very little development. Further still is the beach at Ostriconi - fine sand and totally unspoilt, but difficult to get to, necessitating quite a lengthy walk from the campsite to reach it. Monticello is the village where it is believed that Christopher Columbus's mysterious mother Susanna Fontanarossa was born and offers sweeping views over L'Ile Rousse and up the western coast of Cap Corse. From the village, why not go pony trekking through the Balagne hills to discover the area's true natural beauty. Escape to the Tartagine forest and discover a fantastic area of wild countryside in Corsica's National Park region with stunning mountain lanscapes, snow-fed rivers rushing over granite boulders and pine trees. Visit the Parc de Saleccia, 4km east of L'Ile Rousse - a must for those who appreciate the beauty of Mediterranean flora.